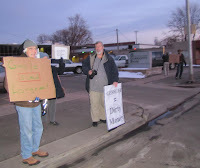 Colorado Secretary of State Candidate Scott Gessler paid a visit to Longmont Wednesday night in what turned out to be a very well attended event, including a handful of protesters who Scott personally engaged on the sidewalk where they gathered. (Full disclosure, Scott is a friend and was our attorney in our successful First Amendment lawsuit against the City of Longmont). Some of the signs were a little confusing, yet humorous. One said “Gessler sued Longmont“, well, actually a bunch of plaintiffs sued and he was the attorney, which was in a few papers several times – not exactly unknown information. Another comical one was “Gessler = Dirty Money“. I believe the money the attorneys got from Longmont was quite clean actually. Or is that a knock on the federal judge or the city council for unanimously agreeing to the settlement? Logic is usually not part of the equation when dealing with this handful (literally, the same handful we hear from on the screwball left of Longmont) of, as Longmont City Council member Sean McCoy put it, “a small disconnected fringe element” or something to that effect. As usual they looked like the ragtag pack of homeless cretins you wouldn’t want in your home – but Mr. Gessler gave them his ear and reiterated during his talk (along with former Longmont Mayor Leona Stoecker as she introduced him) that he fights for everyone’s First Amendment rights, including theirs. As you can see, I’m not as gracious – especially when one of their pillars Ruby Bowman (aka Prairie Dog Lady) called everyone attending this event a bunch of “scumbags” supposedly. The protesters attended it, too, so she’s partially correct in a way. I’m often more critical towards someone I’m in favor of than someone I’m against when listening to talks and speeches like this. Usually it’s to give constructive criticism and look for weak spots to correct, good and bad impressions, places where the casual observer may not understand or like something said or how it’s delivered, etc. I already had the benefit of seeing Scott in action in federal court, where he handled himself extremely well. I’d only met Scott recently when our case was filed and didn’t even know he was a candidate for this office, so it was a clean slate for me. Scott gave a great talk hitting all the important areas of why he’s more than qualified to be Secretary of State. What was surprising was hearing of cases he’s fought that were for political polar opposites from himself, including a Socialist candidate. While he makes no apologies for being a Republican, he also acknowledges the rights of every person or party as long as they follow the law. He wants to help administer that law, with the obvious attention to campaign and election law, which is his area of expertise. His opponent on the other hand has no experience in these areas. As the campaign moves along I (or the Longmont Examiner, aka Mrs. Longmont Advocate) will talk about the duties of the Secretary of State (something we have some direct experience with) and the background and experience of the candidates. While I’ve volunteered to varying extents for five campaigns (and am 5-for-5 in victorious campaigns), I’ve never contributed money to anyone running for any office. Tonight that changed and I was honored to have Scott ask me to co-host this event. Scott will most likely be running against the George Soros/Leftwing funded “Secretary of State Project” as much as he’ll be running against his opponent. They were unsuccessful last time they tried this in Colorado, and this race isn’t yet on their website. But give it time. I don’t like the financial aspect of campaigns, dislike asking people for money even more (probably why it’s unlikely I’ll ever run for office), but Scott will need a lot of money to overcome this radical leftwing machine. Remember, they can’t win if they don’t cheat. Having a Secretary of State in office who will catch and stop their cheating is public enemy #1 to them. One word: ACORN. Need I say more? Visit Scott’s website at ScottGessler.Com and find out more, and contribute money if you feel so inclined. 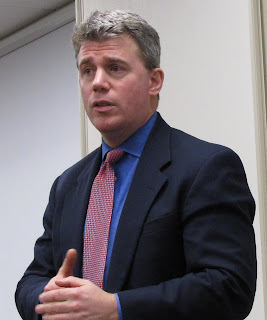 Tagged campaign finances, campaign law, leftwing lunatic fringe, Longmont, Scott Gessler. Bookmark the permalink.